Be sure to check out the Taste of Glen Ellyn this weekend. The festivities kick-off at 5PM this evening (Friday, May, 18th), and continue on throughout the weekend. The forecast is calling for plenty of sunshine and warm temperatures, perfect for one of the earliest of DuPage County’s summer festivals. The event features great food from local vendors, carnival rides, a craft fair (Sat. and Sun. only), and plenty of fun for the entire family. The Taste of Glen Ellyn is located in downtown Glen Ellyn. The stage and food vendors area are located at the parking lot adjacent to Giesche Shoes at 400 N. Main Street. The carnival is located just north of the train tracks (about two blocks away). 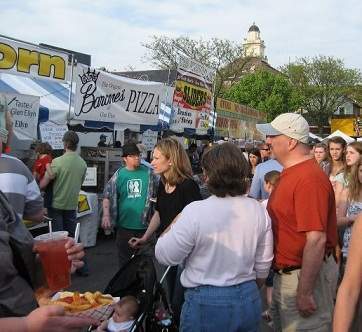 Admission to the Taste of Glen Ellyn is free. Special pricing for carnival rides is available (visit the ticket booth for details). Enjoy what’s sure to be a beautiful weekend at this family-friendly event!